Liquidated damages are similar to penalties from by U.S. Customs & Border Protection. They are issued on the same form called the “Notice of Penalty or Liquidated Damages Incurred and Demand for Payment” (CBP Form 5955A). They differ from penalties because they are a charge against the customs bond, whereas a penalty is not a charge against the bond. They are sometimes confused with penalties because they can have a penal effect, come on the same form, and aren’t always strictly compensatory. What happens when the conditions of a customs bond are breached? 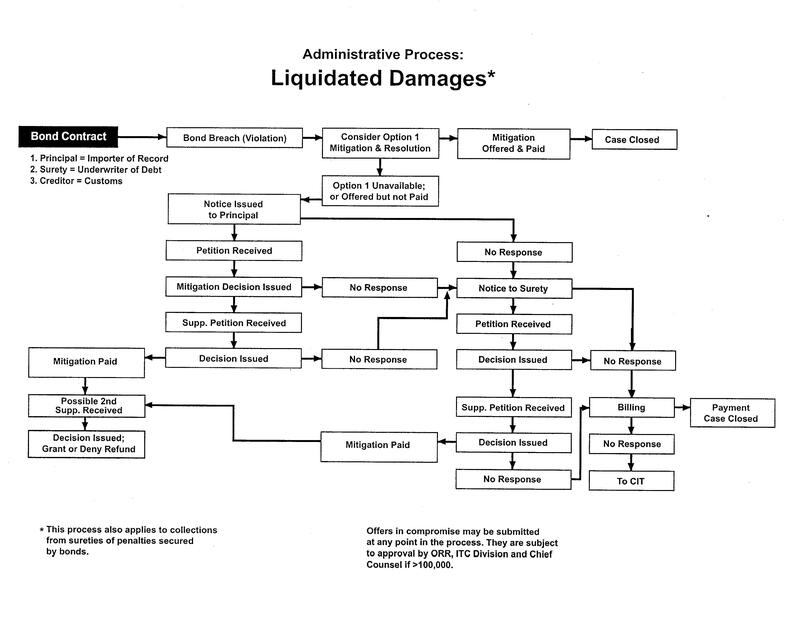 A chart showing how liquidated damages are process by CBP. between customs and the importer to pay duties, taxes, and charges, to complete entry, produce all necessary documentation to classify, value, and collect statistics, to re-deliver merchandise on demand, and lots of other similar requirements. If the importer breaches any of these obligations, Customs may assess liquidated damages against the importer and, if the importer fails to pay the them the bonding company, as surety, will be liable to Customs for the amount assessed, up to the value of the bond. Of course, if the importer does not pay but the bonding company does, the bonding company may sue and seek collection against the importer to compensate it for its loss. Is mitigation of liquidated damages possible? The good news is that mitigation of liquidated damages is available after they have been assessed. Similar to a customs penalty, they can often be greatly reduced through the mitigation process. If you’ve received a notice on CBP Form 5955A, contact Great Lakes Customs Law today and we can discuss what opportunities are available for obtaining mitigation of liquidated damages.